Water from Melamchi will finally flow out of Kathmandu taps, but not everywhere. 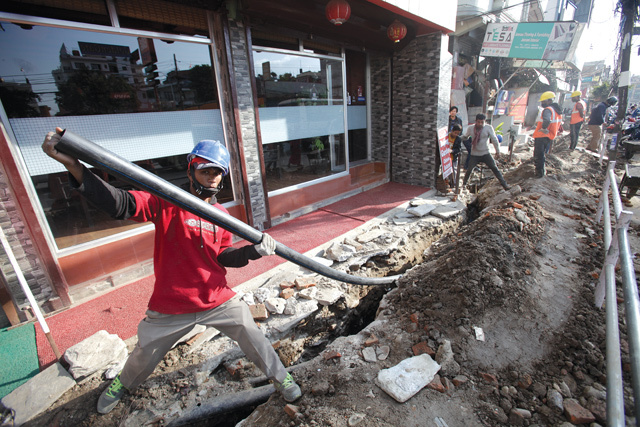 Nearly two decades after Nepal initiated a multi-million dollar project to bring snow melt to its parched capital, the residents of Kathmandu Valley are finally hoping to get regular water supply piped to homes. The good news is that the 27 km tunnel from the fringes of the Langtang National Park to Sundarijal on the Valley rim is nearly complete. 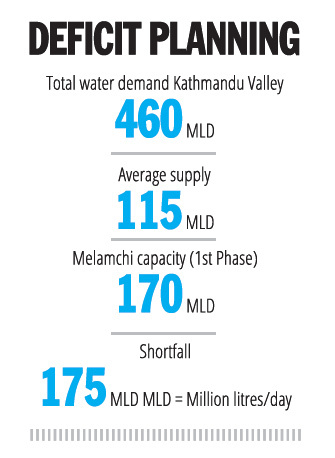 Soon, 170 million litres/day from the snow-fed Melamchi River will be flowing into Kathmandu. So far so good, but political interference is delaying the agency responsible for distributing that water in Kathmandu, and the Asian Development Bank (ADB) which is the primary lender in the $317 million project, is so exasperated it is threatening to pull out. Also, since the Valley’s population has more than doubled since the project was launched there will not be enough water for everyone. The public-private utility, Kathmandu Upatyaka Khanepani Limited (KUKL), is responsible to manage water supply to the Valley’s 3.6 million people and needs 460 million litres/day if it is to reach everyone. But even after bringing Melamchi water there will be a shortfall of 175 million litres/day. “The valley residents are probably hoping for abundant water supply when the Melamchi project is complete, but they will be disappointed,” warns KUKL General Manager Mahesh Bhattarai, who fears an outburst of public anger when some neighbourhoods get water and others don’t. 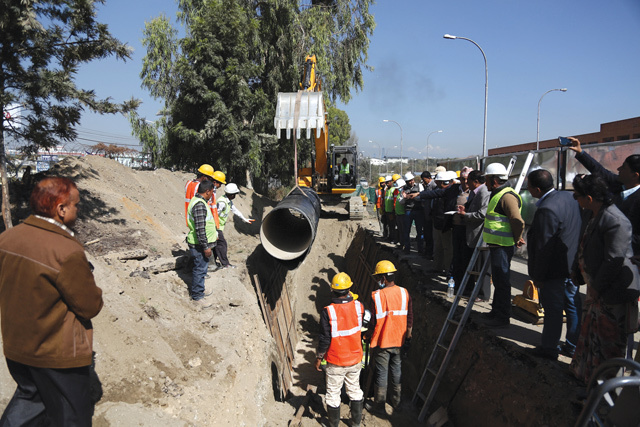 More than 425 km of water pipes have already been laid, and an additional 245 km of pipes are expected to be laid before the arrival of Melamchi water to be pumped into over 100,000 households inside the Ring Road. This network will be fed by nine new and five existing reservoirs on the city’s outskirts. The construction of a receiving facility in Sundarijal is also nearly complete. “We will get the infrastructure ready well before the Melamchi River is diverted to Kathmandu,” says Tiresh Khatri, Chief of the Project Implementation Directorate (PID), a government project to replace the 100-year-old water distribution network in Kathmandu. 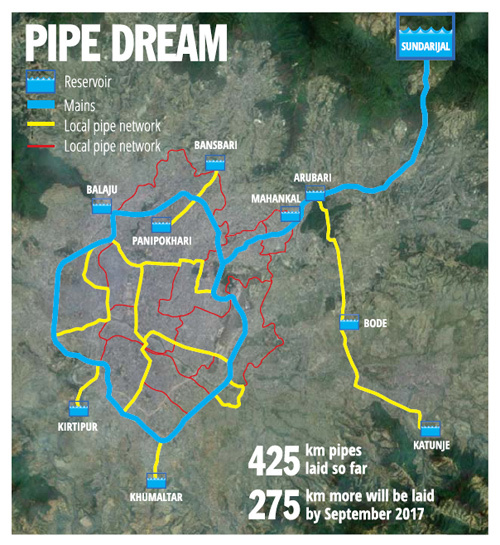 But even if the PID and KUKL finish laying the pipes in the next ten months, two large parts of Kathmandu inside the Ring Road will still be left out of the grid. This means over 40,000 houses in Maharajganj, Dhumbarahi, Gongabu, Swayambhu and Chhauni areas will have to rely on antiquated and leaky Rana-era mains to get Melamchi water (see the map above). 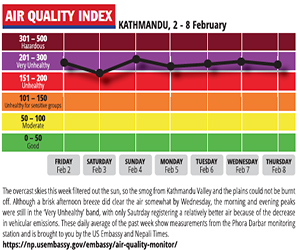 Bhaktapur is not even included in the current phase. And KUKL will have sufficient water to meet the demand of the entire Valley only when an additional 170 million litres/day is brought from Yangri and Larke Rivers each 12 km upstream from Melamchi to the tunnel. But the ADB, which contributed $137 million loan and grant for the project has warned it will not lend any further money to build the additional tunnel to connect the Yangri and Larke Rivers to double the water volume in the tunnel. The ADB is not happy with political interference, which has resulted in chronic underperformance at KUKL. The utility needs strong management and a visionary board of directors, but is crippled by a dysfunctional board backed by corrupt politicians. After the World Bank, Norway and Sweden pulled out in 2005, the cost of the Melamchi project was lowered from the original $464 million. KUKL was set up in 2008, and it carried the legacy of its predecessor Nepal Water Supply Corporation (NWSC) which was politicised, over-staffed and debt-ridden. Political leaders used the NWSC to dump unemployed cadre, and KUKL inherited many of them. What was supposed to be a new and efficient water supplier was shackled with the same bloated system that ruined the NWSC. The KUKL board is virtually paralysed with board members divided and accusing each other of obstructing reforms. At a time when the KUKL needs to get its act together for smooth distribution of Melamchi water, its Chair Suresh Basnet has been abroad for weeks. 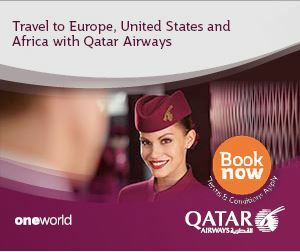 The KUKL has redundant administrative staff, but lacks technical manpower like engineers, overseers and plant operators. To end this mismatch, KUKL announced vacancies and interviewed candidates to choose 216 technical employees. But Basnet is allegedly dangling these vacant positions in front of politicians and promising to recruit their family members, relatives and cadre. “Without sufficient technical and trained staff, it would be difficult to manage Melamchi water smoothly,” says KUKL General Manager Mahesh Bhattarai who is trying to introduce reforms like Supervisory Control and Data Acquisition but needs to be supported by the KUKL board. Instead of making policy decisions and enabling Bhattarai to introduce reforms, Basnet is blamed for trying to oust him. The induction of Rudra Gautam into the KUKL board is a sign that Basnet is still wielding influence. Both Basnet and Gautam have high-level political protection. Two months ago, Basnet approached Prime Minister Pushpa Kamal Dahal to appoint Rudra Gautam as a board member and the Chair of the KUKL recruitment committee. When other board members opposed him, he called Dahal’s adviser Ramdip Acharya straight from the meeting room and told him that the PM’s directive was not being followed. Gautam was finally appointed, but not as recruitment chief but a board member. A board member told Nepali Times: “Basnet’s motive was clear: he wanted to intimidate us by name dropping the PM.” Basnet is also said to have influenced former Urban Development Minister Narayan Khadka to include his cronies into the board. “It was during the general convention of the Nepali Congress, and Khadka needed money to be elected as a central committee member of the party,” the board member said. Basnet had previously appointed Gautam as KUKL General Manager, but the Supreme Court dismissed him on legal grounds. Gautam says he is not interested to head the KUKL, and has nothing personal against Mahesh Bhattarai. “Instead of being suspicious, he should just focus on running the company,” he said. The ADB also expressed its dissatisfaction about Gautam’s appointment. In a letter to the government, the ADB said that the ‘selection procedure needs to be on the basis of merit, and it should be transparent’. In the past, Gautam had to step down as the KUKL Chief after being accused of misusing KUKL vehicles and arbitrarily raising his own salary. He and Basnet also created difficulties for an ADB-hired consultant to introduce reform measures in the KUKL. Gautam denies these charges. Last month, a parliamentary committee instructed the Melamchi Water Supply Development Board to complete tunnel construction by September 2017. As the Italian firm hired by the Board now needs to dig only a 6 km stretch of the tunnel, the new target seems achievable. Dogged by delays, the International Mountain Museum in Pokhara is now scheduled for opening in 2002. Fashion boutiques have blossomed in Kathmandu, and women are saying "Were Free!" with their clothes.